WOODLAWN — A new, 180-room hotel will be built on the site of the former Hyde Park Day School on the University of Chicago’s campus — just about a block away from the planned Barack Obama Presidential Center, the university announced. 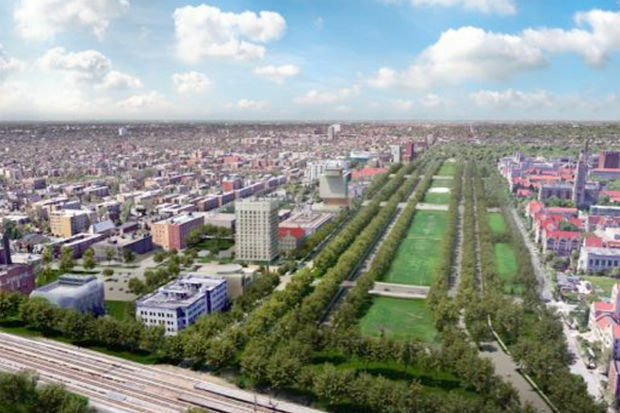 The Study at the University of Chicago will be built on a 70,000-square-foot parcel at the corner of 60th Street and Dorchester Avenue. The site has been quiet for three years since the Hyde Park Day School and Orthogenic School left the building for its new home in 2014. According to a presentation from a meeting Wednesday night at the Chicago Theological Seminary, the hotel will include a 1,500-square-foot fitness center, 2,200 square feet of meeting rooms and an 85-seat restaurant and bar. The university announced plans for a hotel last year, but has provided few details as it expands construction on the southern edge of campus. Calmetta Coleman, a spokeswoman for the university, said the university was not sharing when the project would start or what it was expected to cost. 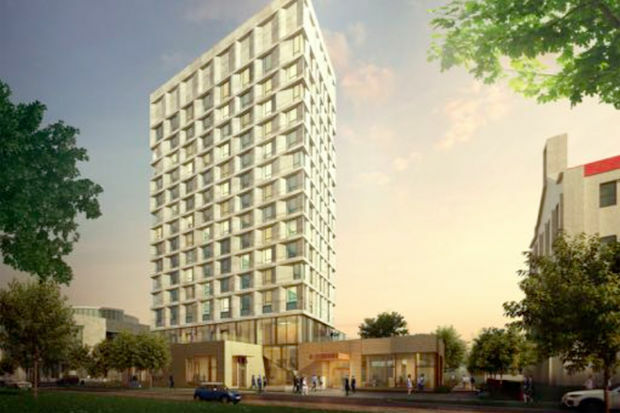 Renderings released by the university show plans for a 15-story tower that would replace all of the existing buildings. The 190-foot-tall hotel would be the closest to the planned Barack Obama Presidential Center, which is slated to be built a little more than a block away near the corner of 60th Street and Stony Island Avenue. It would also mark the first time an entire building on campus was dedicated to a for-profit business. "While the hotel is being privately developed and will not be owned by the university, like many other buildings on our campus, it will include amenities that serve both the university and the larger community," Coleman said. 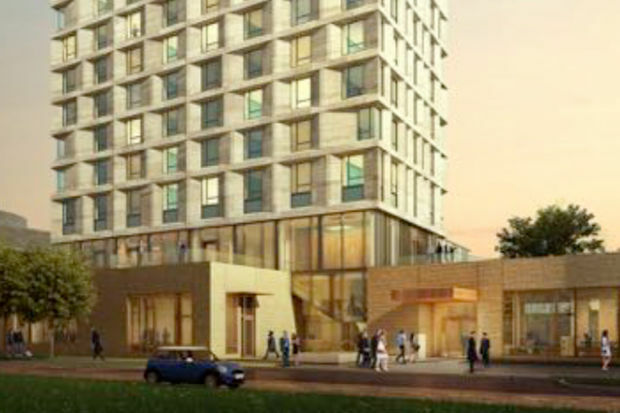 The hotel is being developed and will be owned by Hospitality 3, a New York City-based firm that has also developed hotels at Yale University and in the University City neighborhood of Philadelphia. A representative from the developer could not be reached for comment. 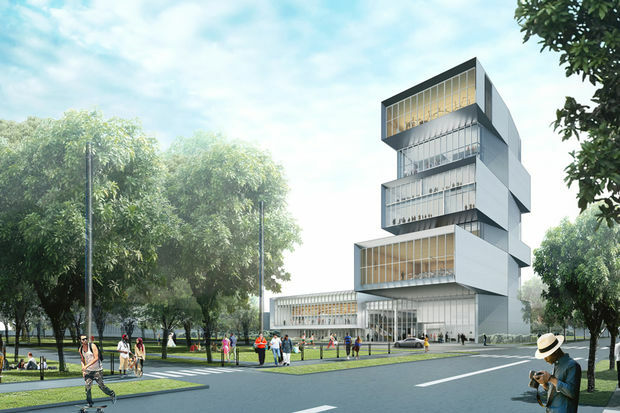 The meeting also presented updated plans for the Rubenstein Forum, an academic conference center to be built on the corner of 60th Street and Woodlawn Avenue. The main structure of the building will become slightly larger and the facade will change entirely to a new cladding of zinc and glass. University officials have said the new center would require more hotel options close by as the center brings in more outside academics for conferences on campus in one centralized location. Renderings show south campus would have two new towers including the hotel and the academic conference center. The new cladding for the Rubenstein Forum will be glass and zinc.